Winter comfort. | Nicki Kinickie Nicki Kinickie: Winter comfort. Clothing wise, winter is about two things: looking glam and party ready or being comfy and cosy. For me this year it is mainly about the latter. Gone are the days of Christmas work do's and getting dressed up and picture perfect only for you to end up looking like Heath Ledgers joker with wine down your frock come midnight. Yes, there are some work do's I look back on and laugh and there are some I look back on and cry, that's the whole point though isn't it? That's what they're all about: Who snogged who, who drank too much, who cried, who threw up. Ahhhh memories. The point I am making though is that I don't mind. I like joking that I am a bore who is in her PJ's by 7pm most nights because this is where my life is now and also because I am pregnant and it bloody tires me out! I have done the partying, I have had amazing night outs with great friends. I have had wonky Wednesdays up the pub and gone into work amazed that I remembered how to put my trousers on due to still being bleary eyed from the night before. I have rocked up at my desk in last nights make up because of wanting that extra time in bed. I have gone to important meetings where I needed to be alert with a washing machine stomach. I've had liquid lunches. I have walked home from many a night out bare foot and in the morning light having not been to bed. I have laughed and danced with my friends til the early hours. I have done it all. I have had fun. I am not over the hill yet but I like my life being a bit more stable, I do miss the whole buying a new dress, getting glammed up and going out bit though.... maybe next year! Anyway, COMFORT. If you are not going out to paint the town red then it is all about being snug and warm indoors with a mince pie and hot chocolate no? What is cosier than being in a chunky knit jumper, PJ's, hiding under a duvet with the only light filling the room coming from fairy lights and the fire? PERFICK. This year I wanted some Christmas Jammy bottoms (Pyjama trousers) and knew Primark would be the place to head to. 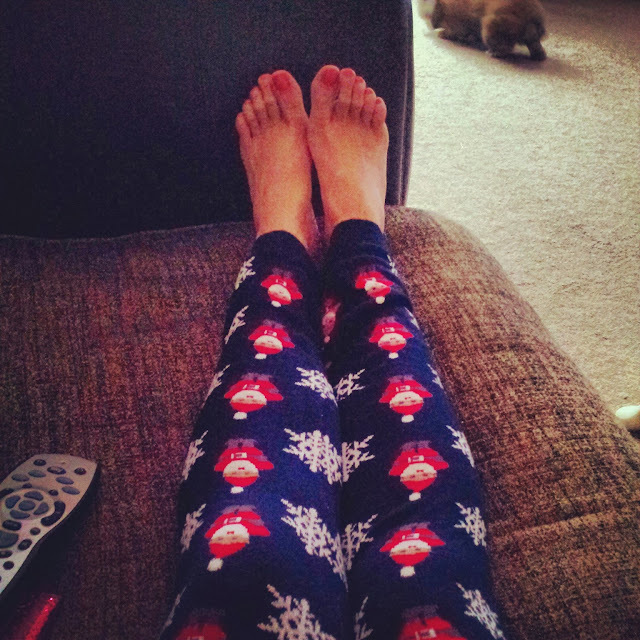 Lo and behold I found some knitted, warm comfy legging type bottoms adorned with snowflakes, trees and Santa. They had be mine! They only had size 12's left so I worried they may not go on over Christmas bump but they did and what's even better is they stretched quite quickly through wear so are nice and comfy now. They will still fit nicely next year too. These are my MUST WEAR item for December, I am even half tempted to wear them Christmas day with my cheesy Christmas jumper. I think it's going to happen. So while you lot sit out there browsing online stores, click clicking away for your must have outfit for this years party season, I already have my Christmas 2013 outfit sorted. Now where are my mince pies?